You’ve likely been there. You’re waiting in the coffee line. You order and proceed to pay for your purchase. Then the cashier tells you that the person in front of you paid for your order. You are overwhelmed by the generosity of a stranger. You decide that on your next coffee run, you’re going to pay it forward. You buy the coffee for the person in line behind you. You realize that it feels even better to give than to receive. Our Executive Team and their support staff know this feeling all too well. They’ve been buying coffee for people in line in the cafeterias, buying lunch for their colleagues, putting together care packages for their team members to help them get through stressful times and creating wellness packages for people in need within the community. They are also mindful of the small acts of kindness that we do every day, that really make a difference in someone’s day. Taking the time to say hello, to stop and listen, hold a door for someone, be kind to one another and taking a little extra care and attention when it’s needed most. "The exercise of being mindful, kind and more aware has become a fundamental part of our culture,” says Niagara Health President Suzanne Johnston. 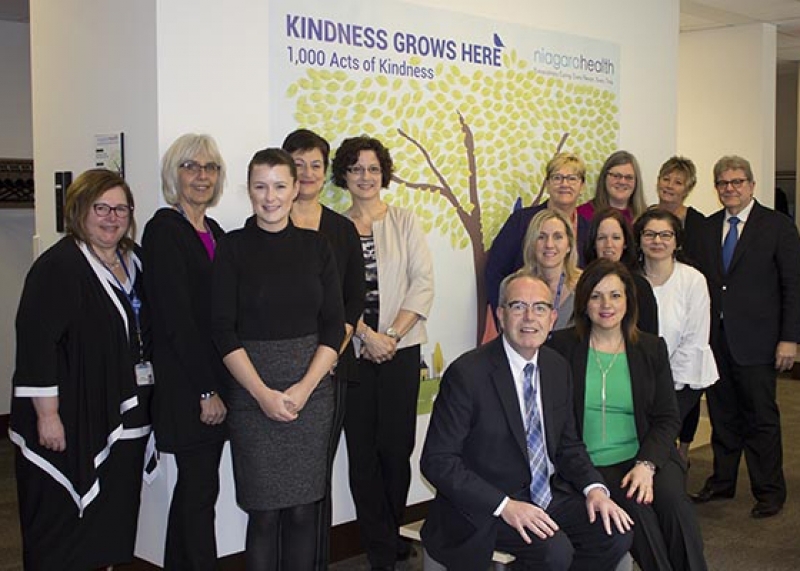 “Taking kindness outside our walls and into the community is part of the way we are working to create a healthier Niagara." The Executive Team joined our workplace Acts of Kindness Challenge on March 19 and set a goal to complete 1,000 acts of kindness in one month. And they did exactly that. 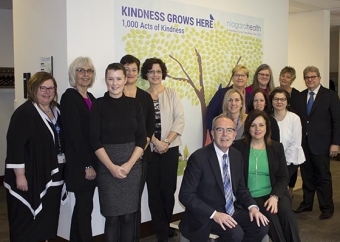 "Our Acts of Kindness Challenge is part of our deep-rooted purpose to focus on others"
They designed a "tree of kindness" that was displayed on the wall in Corporate Services at the St. Catharines Site. Throughout the challenge, team members recorded their acts of kindness on leaves that were displayed on the colourful poster. The tree represents Niagara Health, rooted in our CORE values of compassion, optimism and achieving ambitious results and our vision of creating A Healthier Niagara. Now, after completing the challenge, they are paying it forward by passing their “tree of kindness” over to our St. Catharines Site Surgical team. The surgical team has volunteered to take on the challenge. Our Cardiac Care team is also up next for the challenge and will be recording their acts of kindness on hearts – a fitting theme. The Greater Niagara General Intensive Care Unit has committed to carrying out at least one random act of kindness for patients and staff every month. The idea for the Acts of Kindness Challenge originated with our Information & Communications Technology team, who came up with the idea as a way to connect their daily work with our Strategic Plan. Other departments quickly jumped on board, volunteering to participate. The grassroots initiative grew from there. So far, 14 departments across all of our sites have participated. "Our Acts of Kindness Challenge is part of our deep-rooted purpose to focus on others," says Suzanne.